"I love to make people look good"
Alice first began her career in hairstyling as a hands-on apprentice in 1985. 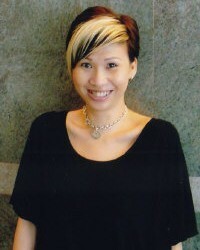 After a few months of on-the-job experience convinced her that this was the job for her, Alice took off to London for a formal grounding in hairstyling techniques, and even enjoyed several short courses in Italy and Germany before returning to Singapore to hone her skills. Alice was awarded the prestigious Young Protégé Award (1993). This award is presented to the most talented up-and-coming hairstylist of the year. "It was a great honor, and really inspired me to work harder at what I do." Alice was also placed within the top ten award winners for the Bridal Styling Gala Show, an event that is attended by Singaporean hairdressers interested in the latest bridal hair trends. She is also involved in several fashion shoots for top local fashion and women’s magazines, such as Her World and Female. When she’s not spending quality time with her son or sharing a bottle of wine with good friends, Alice can be found shopping or bowling. … that she’s an ace bowler with a 150-pin average!